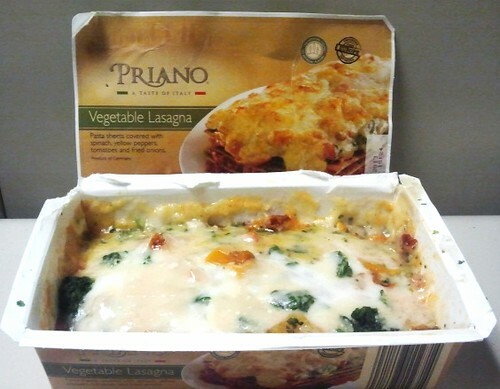 Priano Vegetable Lasagna, an ALDI house brand, is probably one of the most unusual frozen lasagnas I've tried in some time. First of all, there is absolutely no ricotta cheese - or even any cottage cheese - within its layers. Eash seet of pasta is separated by a lightly seasoned layer of pale red (almost orange) tomato sauce. And, although both the box art and the ingredients indicate that the pasta is going to be green spinach pasta, this is not actually the case; the only thing there is plain ol' standard sheets of lasagna noodles. The lasagna certainly delivers the mozzarella, though. the first thing you'll notice when the package comes out of the microwave is the thick mozzarella topping studded with bits of broccoli, sauteed onion bits, and what I think are either carrots or tomatoes. Overall, I liked it even though it really wasn't what I was expecting. On the other hand, this Priano lasagna was imported from Germany. What do the Germans know about making lasagna, anyway? 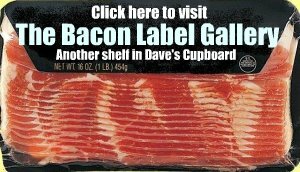 To see how this lasagna stacks up against other frozen lasagna brands and varieties, click here.